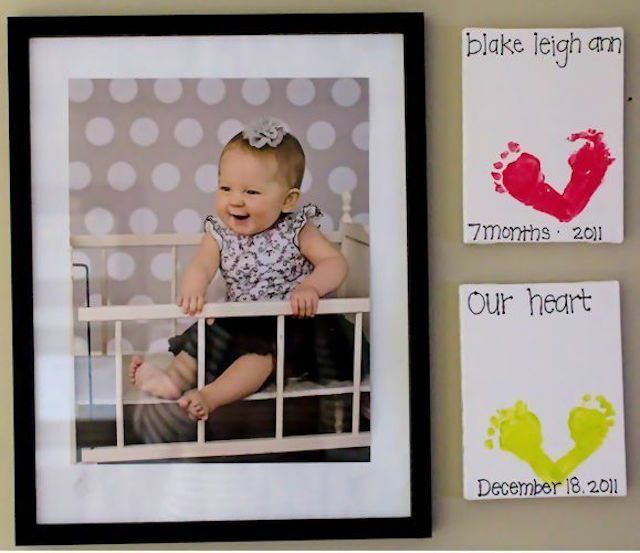 Katie Brockpahler, from Katie Brock Photography, submitted this fun footprint canvas craft she made. This is a great craft to make using a baby's footprint or for any age. It makes a fun gift for grandparents and other relatives. One thing you may need, that is not listed in the material list above, is a lot of patience if you are working with a younger child. You might want to have a trial run using paper or have an extra canvas or two on hand! This project is definitely easier if you have a couple of adults help with it. Start off by covering your work surface well. Paint the bottom of the child's left foot (If you have a ticklish child, spread out some paint on a paper plate and press the child's foot into the paint). Press it onto the canvas. You will want it a little offset to the left side of the canvas. You may also want it centered evenly between the top and bottom of the canvas. As soon as the print is made, wash and dry the foot. Now paint the bottom of the right foot. Press it onto the canvas. You will want this one offset a little to the right and the heel should over lap the heel of the left footprint. The desired outcome is to have the two footprints together look like a heart. Set the canvas aside to dry. Once the paint is dry, use a permanent marker to write the child's name and the date or anything else you like. You can now hang it next to a precious photograph of the child, as shown here, or give it as a gift.